We are also already the home to 13 other communications-focused podcasts. We have shows that report on communication disciplines (such as FIR B2B and All Things IC), skills (like TV, FIR On Strategy and FIR On Technology), channels (like Linked Conversations and TV@Work) and verticals (like Higher Education). All this made it clear to us that the website we launched 10 years ago to host one podcast was woefully inadequate. For well over a year now, we’ve been working to develop a new site. Our goals were simple enough: Offer a site that reflects the current state of podcasting and that makes it easy for people to find, subscribe to, and engage with any of FIR’s shows, on whatever device they use; and provide our podcasters with a powerful platform that’s easy for them to use and publish their shows. Thanks to the hard work of some highly valued and talented volunteers, we have a new site that delivers on those goals. (We would be remiss if we didn’t point out that these volunteers are also part of the FIR listener community.) Sallie Goetsch (rhymes with “sketch”) – a knowledgeable and skilled WordPress developer through her WP FanGirl business – performed the lion’s share of the work required to create the site, while the good folks at Effective Edge Communications handled the design of the artwork for the FIR Podcast Network’s identity, along with all the great cover art associated with each show. We’re launching the new site on the WordPress platform, recognizing the compelling advantages of a content management system that powers more than 60 million websites worldwide. The new site is just the first step in a series of evolutionary changes to FIR. We’ll announce each of these when we’re ready; but we can anticipate at least one of your questions, and yes, we will have more new podcasts joining the network. 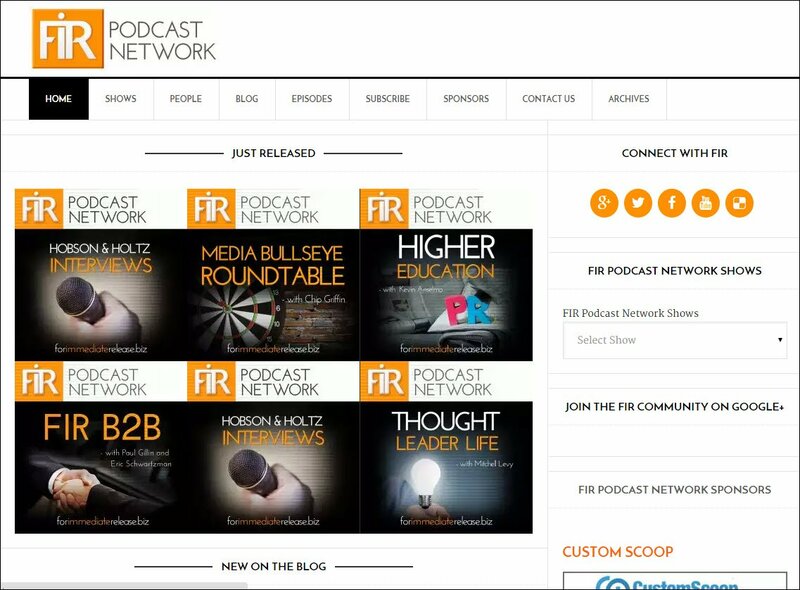 In the meantime, please enjoy all the great content the FIR Podcast Network has to offer you. Your participation as a member of the FIR community means the world to us, and we plan to do everything we can to deliver consistently high-quality content that entertains you, excites you, inspires you, and helps you stay on top of the ever-shifting sands of the communication environment.